Good evening everybody, and welcome to this real estate investment seminar. I’m Larry Fullerton. Kyle, I think, decided because he looks so young that it would be appropriate to ask some old grey-haired guy to give a little credibility to him, (laughter) so that’s why I’m here. I’ve been full time actively involved in the real estate community of Denver for almost 35 years in more than one role but I’ve seen a few of you in my role as a developer of lofts. Some of you, thank you, have sold a few of them for me and I appreciate that. Throughout a career like that, I’ve been lucky in many ways and the luckiest I’ve ever been is when I stopped in 2006. I am a semi-retired developer but I currently run a nonprofit called Hope Communities which is a 31 year old non-profit that provides rental housing for low income families in Denver. We own and operate a handful of apartment buildings and that’s how I met Kyle Malnati. In a career like mine every now and then you are blessed with certain things and one of which is meeting stars. 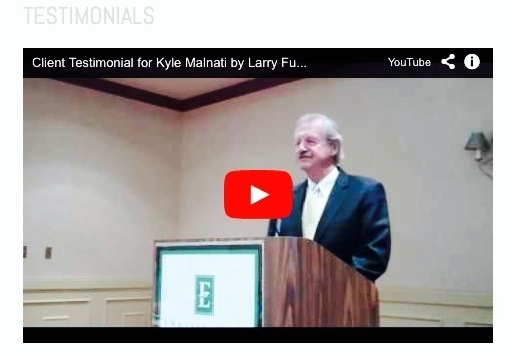 In my career, I’ve dealt with probably 100’s of residential brokers and all kinds of engineers, architects, marketing people, and commercial brokers and Kyle Malnati is a star. Kyle has, in fact, handled a few transactions for Hope and in the past year and a half I’ve gotten to know him very very well. I’m here mainly to introduce him. His bio is in the paperwork. I’m not going to read it to you, but I will tell you this: in my years working in Denver (which is a wonderful place to work with a lot of good people here), I’ve never come across a broker who works harder, who knows his product better, and cares more about his clients and customers than Kyle does. And he does it all in a gentlemanly way no matter what the situation, (and these deals are not always the happiest and the calmest) but it’s always a delight for me to see somebody who can conduct himself like a gentleman. Secondly, Kyle Malnati has showed to us (Hope Communities) that his heart is in the community. He spent half his time growing up here and went to school fairly nearby. He has been very helpful to Hope and has brought other people in that have been helpful to Hope. I’m here to tell you that you’re about to listen to and learn from a knowledgeable and exciting gentleman. I think you’re the lucky ones tonight. So with that I say thank you, Kyle, for letting me come in to say that and have fun.